OSI Affiliate Software integration offers you an easy way to get in touch with your affiliate partners. Anyone connected to your User Area will be able to start a chat with you. Log in to your OSI Affiliate Software account and click on Settings in the top-right portion of the page. Select LiveChat Integration from the list to proceed. You need to enter your LiveChat code. Log in to LiveChat, go to the My website section and copy the code. Paste your LiveChat code in the integration settings and click on the Update button to finalize. Congrats! 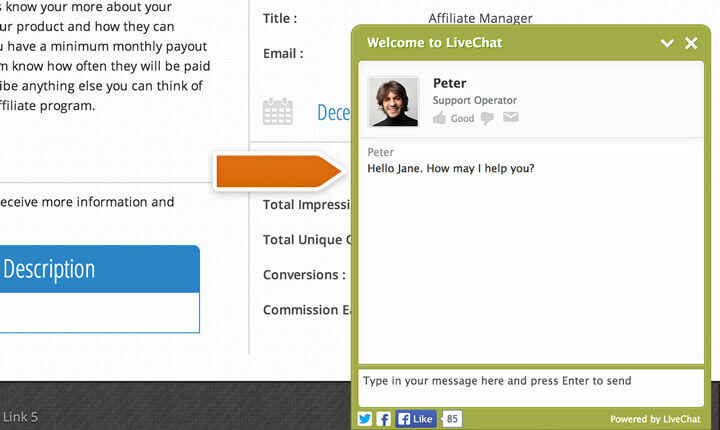 From now on, your affiliate partners will have an easy way of reaching you. Grab one of the available LiveChat apps and start chatting with them right now!